When we talk about the 1st Jan New Year, we all remember the Dec 31st night, the drinks, fireworks, resolutions, party and the next day hangover. But when we remember our new year (Yes, I mentioned our new year because 1st Jan is not our new year. It is adopted western culture) we only think about God, his blessing, the year ahead etc. In some culture they eat a dish that is sweet and bitter. It denotes that life is made is made of Joy and sorrow and we should learn to live with it. 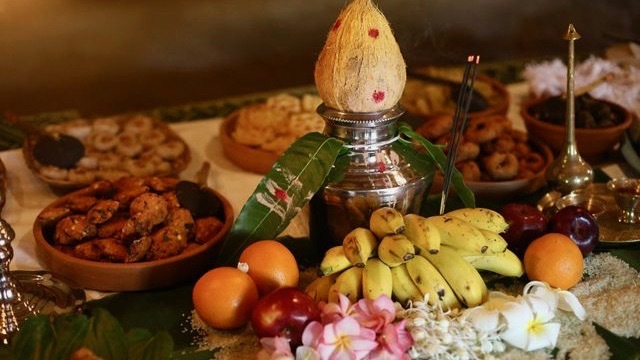 In some culture, they decorate the Pooja room with fruits, flowers, new dresses, jewels, money etc the previous day night. They make sure they walk blind folded to that room in the morning and make sure that they see these as the first thing in the morning. What ever is the culture they all signify the same thing. Love, Life and Prosperity. There are so many new years days in India. அனைவருக்கும் இனிய தமிழ் புத்தாண்டு நல்வாழ்த்துக்கள்!! !